It's in the Urban Dictionary. That's how cool I am. Since I've stopped writing in complete sentences I figure I get to start being - like, urban. I mean - I live a half mile from Detroit. I'm so cool I buy my steak knives from people who have died. 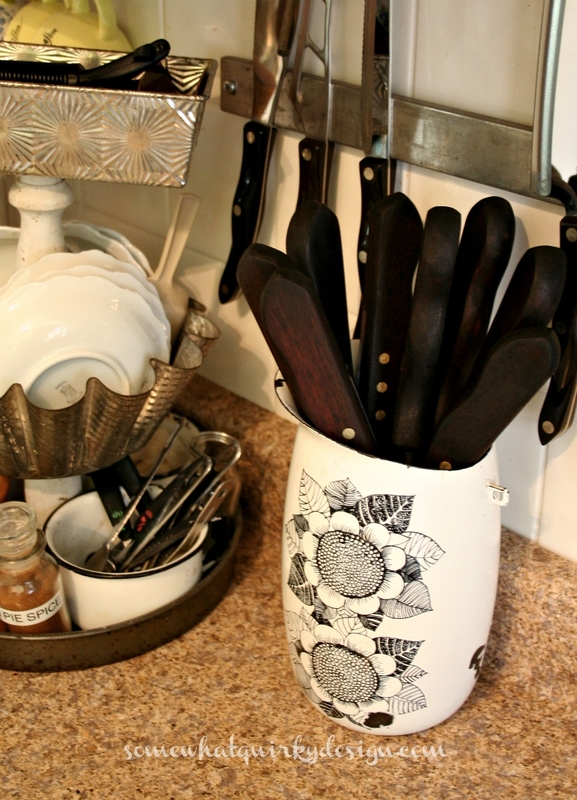 Steak knives from people who have died are by definition janky. Since most of the things I own are janky when I get them, I know exactly what to do. Get out the sander and sand away the jank. 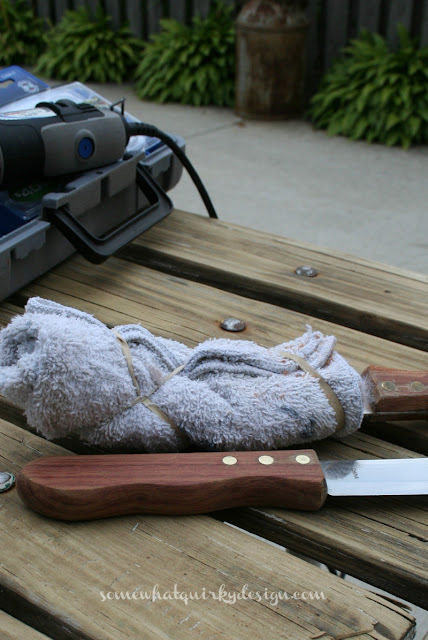 Tip of the day: When you are going to sand away jank from a knife wrap the blade in a thick rag. Even when they are janky. I used my random orbit sander for this job. I tried to use my Dremel, but the little tip that holds the little sanding circle thingy flew off while I was using it. I think over the fence and into my neighbor's yard. Either that or into the garden somewhere. Thus using the power sander. Something I don't recommend for something so small - and sharp. 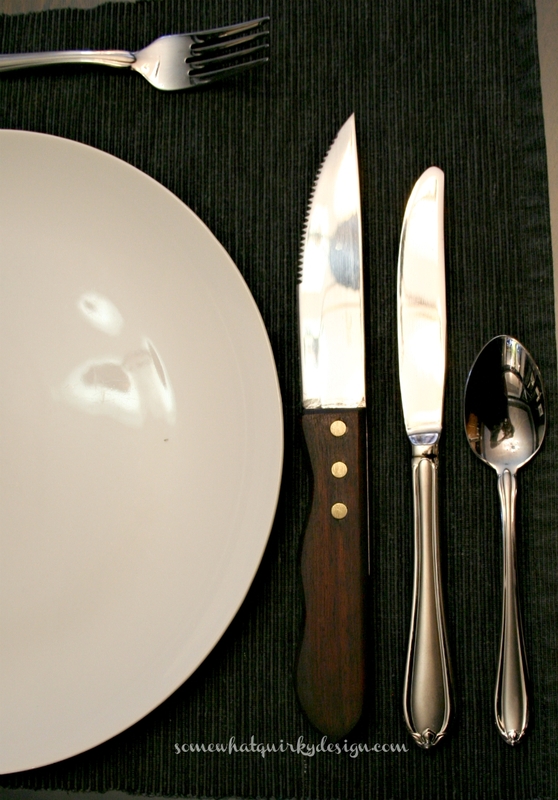 Like a knife. So I'm not going to tell you how I did it. Just that I did it. And that you shouldn't. Actually, I think that it would have been easiest and most effective if I had used stripper on these and then sanded them by hand. Anyway, after I got the old finish off I stained the handles with an onyx stain. After the stain was dry I put a little hemp oil on them. Want to come over for steak? Oh yea, this is one of those little things I let hang around in my mind for 2 years or so before I fixed them. Mind mind is getting a little less cluttered every day. Now maybe I can find my keys . . .
Love Janky!!!! 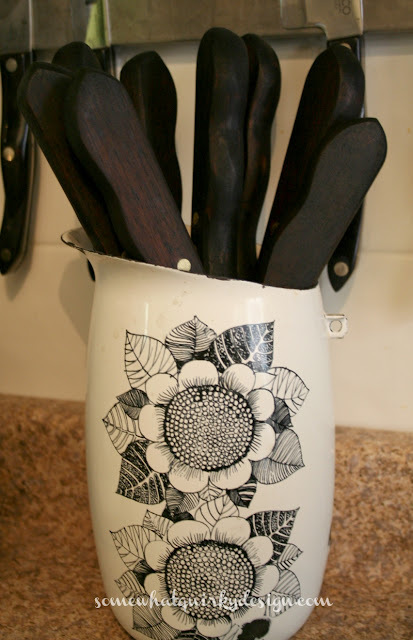 The knives were re loved so beautifully. Great job. Loved your writing, so fun! Not one bit janky! 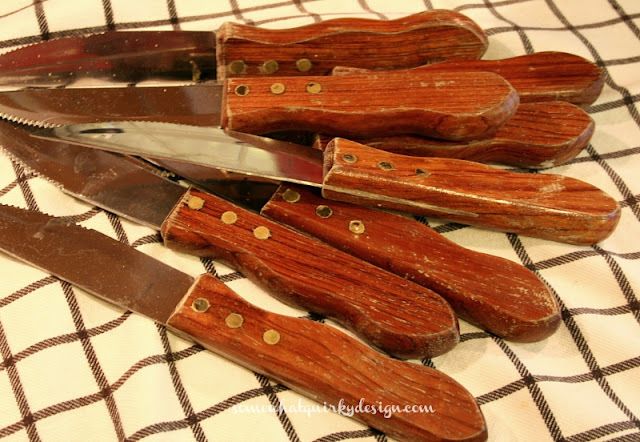 The knives turned out great, I would never have thought! Can't wait for the steak.